Welcome Everyone. Please be sure to check out my J & J Cactus and Succulent Facebook Page. Please do not use Facebook privet message to order plants. Use my email address Cactibud@cox.net. I also have a Ebay Store, jjcactussucculents. You can also scroll down to see our offerings here! 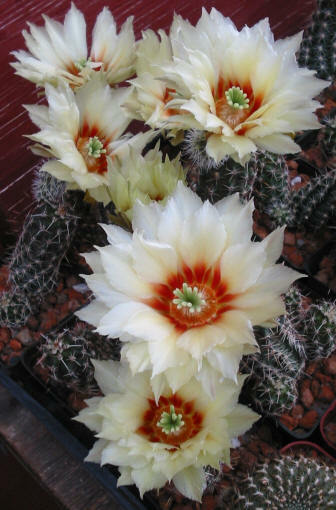 My name is Joyce Hochtritt owner and only employee of J & J Cactus and Succulents. I’m writing to let you know a little about our business. We are a small retail nursery in the Oklahoma City area. I am also a vendor at many of the Cactus and Succulent Society’s shows and sales throughout the USA. Check out our Event Calendar. The plants that are on this list are what’s available for mail order at this time. We also offer many other plants at the nursery that are not included on the list. If you're looking for certain plants send me your list. I am working to get all the pages up-dated with photos, so keep checking back. Also at the nursery we sell our J & J Potting Mix. Visitors are also welcome to visit the nursery, but an appointment is required either via phone or email. Minimum plant order is $35.00. This does not include shipping and insurance. Shipping (US Priority Mail) and handling (cleaning and packing for shipping) will be added to the order. We have a minimum shipping fee of $15.00 per order. For some larger orders or larger plants there may be extra shipping cost, that will be billed to costumer. The order form is for people that will be sending there order by snail mail. I can not hold your orders without payment. I may need the plants for other orders. If your sending payment by snail mail let me know. I will hold those orders for 8 days after placing order. We do not take phone in plant orders. We do not have a fax. Please send an inquiry email to make sure the plants are available with your shipping address. Please do not call for plant availability. Send an email. Please make sure your email set-up does not block my return emails. This mostly happens with .org addresses or email posted from your work place computers. You may send your order by US post with check or money order. If you place an order via email, I with send you a PayPal invoice. For me to hold your order payment must be received within eight days of placing the order. Photos are for reference only. Plant sizes will vary. I always try to send the largest, best looking plants that we have in stock for the price stated. Please list substitutions or request a refund. Sorry, I am not able to keep up with dozens of want lists. It's always first come, first serve. I will take calls for visits to the nursery from 8:00am to 5:00pm Central Time Zone. We only ship to United States addresses (main 48 states). We do not have export permits to ship overseas. I only ship US Post Office Priority Mail that usually takes 2-4 days with tracking number. I can not be responsible for plants damaged by the US postal service. Most orders are shipped on Mondays. Most plants are shipped bare root. I can ship plants in there pots upon request. This will raise shipping fees. Normally, except during extremely busy periods or weather, orders will be filled within 1 to 4 weeks after receipt of payment. Buyer assumes all risk for plants shipped during cold or very hot weather periods. We do ship year round and we will use 72+ hour heat packs at $3.00 per pack during cold weather periods. You must request the heat packs when ordering. If you are not happy with what I send just return them within 8 days. I will send you a check for a refund.